Resolved Question: What do you call a person who collects words? Best Answer: A verbal archivist. Or a fruitcake. Most writers (and many readers) fall into these categories, I think, and I freely admit to being all of the above — except Tracfone Service Person. How else could I explain notes like the “overmorrow, polyemma, tittup” written in the margins of my manuscript? 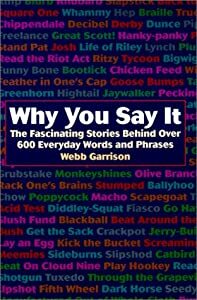 I love “Word of the Day” emails and calendars, and have a bookcase full of volumes like Dewdroppers, Waldos, and Slackers: A Decade by Decade Guide to the Vanishing Vocabulary of the Twentieth Century and Why You Say It: The Fascinating Stories Behind Over 600 Everyday Words and Phrases. 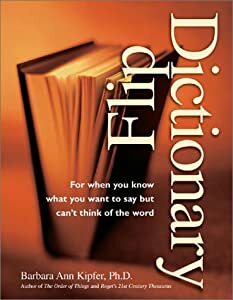 And, of course, I also have the Descriptionary: A Thematic Dictionary, and Flip Dictionary: For When You Know What You Want to Say But Can’t Think of the Word . Thesauruses are my friends, and a new book like Let’s Bring Back: The Lost Language Edition makes my day. There’s no denying it; I’m a little weird about words. But, honestly, what’s not to love about “A Collection of Forgotten-Yet-Delightful Words, Phrases, Praises, Insults, Idioms, and Literary Flourishes from Eras Past”? Full of expressions like loblolly (“a seventeenth century oaf or lout” — even the definition uses words I love! ), glump (“to sulk”) and keep your pecker up (not nearly as dirty as it sounds, the phrase simply means “stay cheerful”). Some words are just fun to use. Groovy, floozy, strumpet and jiggery-pokery come to mind. And let’s not forget fiddle-faddle, malarkey and poppycock. Others, like the aforementioned polyemma, mean exactly what they should. Worse than a dilemma where one has two choices, both of them bad, a polyemma involves multiple options, all of them undesirable. There are also words like impeccable– prefix im- attached to peccable — but no one uses peccable (liable to sin or error) anymore, we only use its opposite. I like those kinds of words too. I read somewhere that the French are very protective of their language, trying to keep out words that stem from other cultures and countries. How crazy is that? English is fun to write because our words spring from a variety of places. Our language is much the richer with words like hooligan (Irish), garage (French), and bamboozle (Scottish). So, call me a verbal archivist or call me a fruitcake, I intend to enjoy playing with our language for a long, long time. What about you? What are some of your resources for great words? Or maybe you could share some of your favorite words and expressions. This entry was posted in Rave, Reading, Writing and tagged Bring Back: The Lost Language Edition, Flip Dictionary, Word-a-day. Bookmark the permalink.